After feeling as if a week has passed (in reality, 2 days) we finally got off the plane, with a new found appreciation for modern planes, and arrived in Kenya! 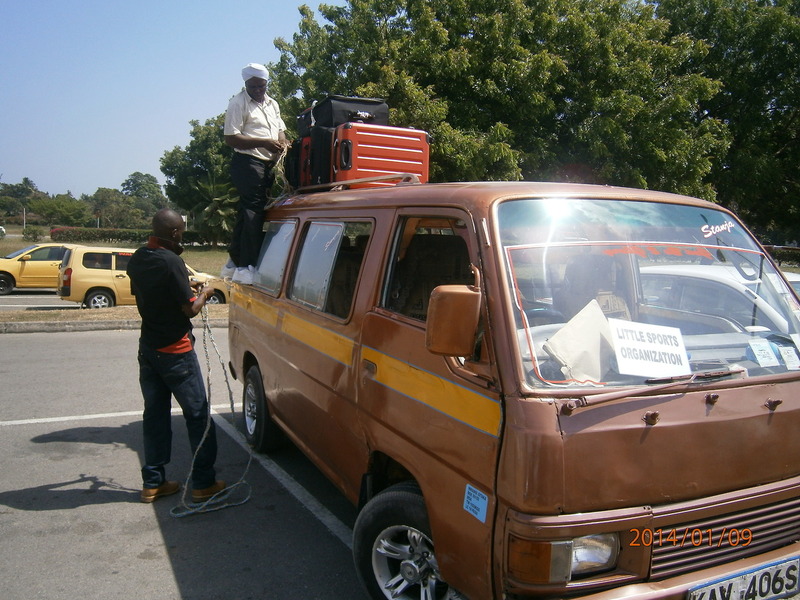 We then pilled into a mini bus which barely fitted all of us inside. Poor bags were forced to ride up top, keeping a keen ear out for any crashes off the roof as we drove though pot holed, rule lacking roads of Mombassa. Had a quick explore of the area including the Forth Theives bar and Diani Beach where we had a quick snack before dinner. The night followed with a wary trip down the pitch black main road with a security guard as backup to the closest restaurant. A quick introduction to African time meant several of us were falling asleep at the table but with food eventually in our bellies we all stumbled home and into the comfort of our beds. Not forgetting our mosquito nets! Having a shower is proving to be quite difficult as once you get out, drying is incredibly hard due to the constant humidity. Had an introduction to the program and quick brainstorm of what we wanted to do on our days off. Had a tour of the local area to gain our bearings and make sure we had some sort of direction…There’s one road. If we get lost it must be a new record of some kind. Public taxi type vans called Matatus drive up and down the main road costing 20 shillings (approx AU$0.20). Anyone can get on if there is a seat (sometimes even if there isn’t!). Was the first day of volunteering today at our first school, one of the 4 schools we shall be working at throughout the program. The kids are absolutely amazing. They were so excited to see us and chased after the van on the way into the school. They were fascinated by our cameras and so much time was filled by taking photos and showing photos to the children. Jess managed to create a new handshake that spread through the school like wildfire and pretty soon we were shaking hands with every child that came me into our vicinity. The morning session was run from 11am-12pm with the lower classes of the school. Games played included ‘the numbers game’, ‘touch and go’, ‘break away’ and skipping. 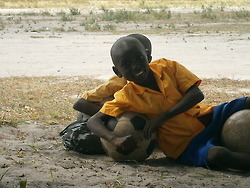 We joined in with these sessions and enjoyed running around and playing with all the kids. The LSO (Little Sports Organisation) staff took the opportunity in this break to teach us about the games we had run in the previous session and also teach us some useful Swahili words that would come in useful over the program. The afternoon session ran from 3:10pm-4:30pm with the upper classes of the school which included a warm up game called ‘turn over hut’ which was then followed by a game of football. The volunteers worked with the children that weren’t playing football and played other games including relays such as ‘over and under’ and tunnel balls. We introduced the game of bullrush to the children and then also played the classic game of duck duck goose. Had the most wonderful first day of the program and I am looking forward to meeting another school tomorrow. The day began with practicing our haggling skills with shopping for souvenirs. Emma is definitely the expert in this area and is very handy to take shopping with you. The first day of our 3 day weekend was spent at the Colobus Monkey Conservation and Primate Rescue Centre. This was just a quick Matatu ride down the road from home. The organisation has been running since 1997 and is designed to promote the preservation and conservation of the threatened Colobus Monkey that lives in the Diani region. We paid our entrance fees and a lovely lady took us around the centre, telling us lots of things about the Colobus monkeys, what they do at the centre and other information including the local flora and their uses. The tour ended on a rather exciting and adrenalin filled rush when Betsy (one of the Colobus monkeys of the centre) ran and jumped up onto Sam, then moved on and jumped onto Kim. Betsy wasn’t intending to hurt anyone and probably just wanted to play with the visitors but this still didn’t reduce the shock! She continued to want to play and ended up leaping from person to person onto Sam, then Kim, then me! The trainers managed to settle her down a bit and we headed inside. 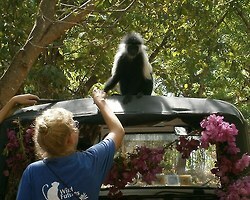 Can definitely say we’ve been up close and personal with a Colobus monkey now. The is an excerpt from the personal blog of Fiona who travelled with BUiLD Abroad partner VOICE to volunteer in a sports education program in Kenya. You can read about all 29 days of her trip at her blog Kenya VOICE. This an excerpt from the personal blog of Fiona who travelled with BUiLD Abroad partner VOICE to volunteer in a sports education program in Kenya. You can read about all 29 days of her trip at her blog Kenya VOICE.